I've been a long time user of Tweetbot on iOS. I love its user interface and responsiveness, and I believe it's the best Twitter client for the iPhone. So when Tapbots released the Alpha version of Tweetbot for Mac, I immediately tried it out. Despite the alpha status, it's a very solid piece of software, highly usable and continually improving. When Twitter announced upcoming changes to its API, a lot of people started questioning the likelihood of third party "traditional" Twitter clients surviving after these changes are applied. Paul Haddad, the creator of Tweetbot, responded in his blog by telling users not to panic because the changes were harmless despite the user caps that Twitter introduced. A few days ago, Paul decided to pull the download link for the Alpha version of Tweetbot for Mac. In his explanation, he mentioned that apparently, user caps would really hurt Tweetbot for Mac when it is released for public. He went on to say that responsible users should start managing their token usages as a way to help third party developers. Just when you thought all hope was lost, Todd Thomas, the developer responsible for Tweetbot for Mac, tweeted that a new build had been released for Tweetbot for Mac. A few folks have suggested that we release a new version but without the ability to add any new accounts, we thought it was a good idea and have done that. Being consistent with his earlier decision to be careful in using user tokens, Paul decided that Tweetbot for Mac will be available only to existing Alpha users and limited to the accounts they have added to that client installation. If you have different Mac clients -- for example an iMac and a MacBook -- you might want to add all your accounts before you upgrade to the Beta version. I'm not sure whether this is still possible or not as of today, but don't close your Tweetbot app before you do this. If, for any reason, you closed your Tweetbot app, then there's no going back -- the next time you open the app, you will be greeted a message saying that your current Alpha build has expired and that you should get the new Beta build. It's important to realize that with this build you can't add or reauthorize any accounts. If you delete an account or de-authorize an existing account you will not be able to add it again until the final version comes out. Fortunately, I have updated to the new Beta build on my MacBook running Mountain Lion (10.8.1). On Monday, I will try to see if I could get it running on my iMac running Lion (10.7.4) in the office. Having read an earlier warning from Todd, I have added all my Twitter accounts to both installations and am grateful for it. The new features are listed in the 0.8.0 change log on Tapbots blog, but to summarize, the new Beta build has a lot of bug fixes. The developers also added expected functionalities, such as pasting an image to the new tweet window, swiping while on multi-column mode, and scrolling down to see more of a user's tweets. I'm particularly interested in the new keyboard-related features that were added to this Beta build. For example, you can now press Alt+CMD+N to open a new column. This is more efficient than having to open a new window (Shift+CMD+N) and attach it next to the rightmost column. You can also do a TAB or Shift+TAB to move from one column to the next. If you combine these with many of the existing keyboard shortcuts already available since the Alpha version, you can get around very fast in the app. A favorite of mine is the ability to hold the Control key while clicking any of the tweet action buttons to easily manage tweets across multiple accounts. For example, holding the Control key while clicking the retweet button will let you choose which account you want to retweet from. You can also hold the Control key while clicking on the favorite button which allows you to promote a tweet to Favstar's Tweet of the Day, whereas the setting button lets you paste the link to the selected tweet in a new tweet window. However, keep in mind that the tweet promotion feature would only work if your account has signed up for the Favstar Bonus Features. Overall, I really like this Beta build. It's a really solid and promising product. Other features such as auto-refreshing columns, local search on any user's tweets, mentions and favorites are really powerful. 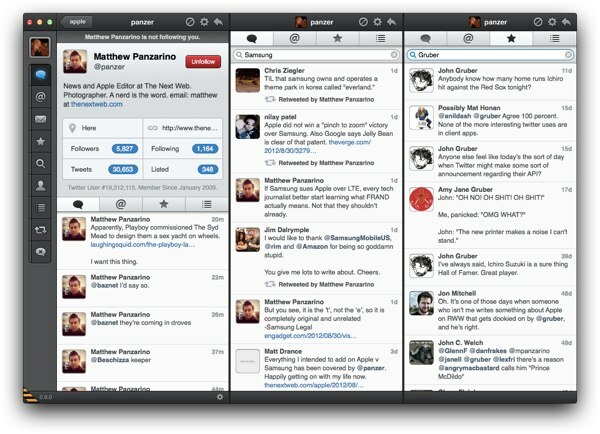 Depending on your use cases, Tweetbot for Mac may become the only Twitter client you need for your Mac. I can't wait until the official version is released.